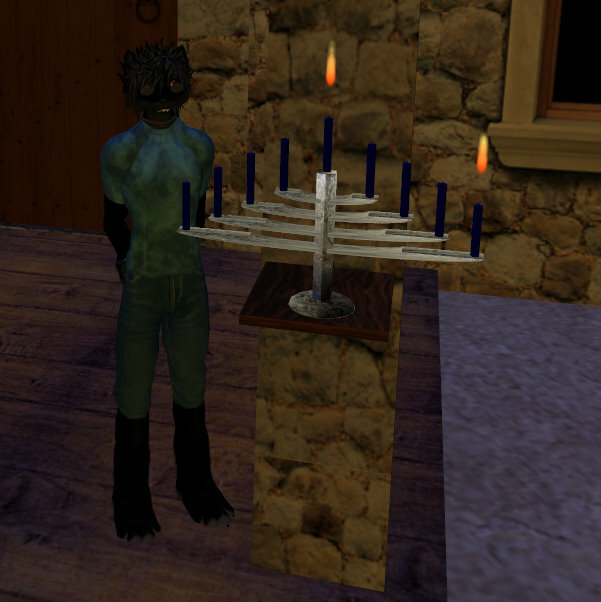 Hag semeach ~ It’s Hanukkah! Maybe you’ve heard the story about the miracle of the lamp oil? Here’s an excellent summary of the whole deal, but – just to re-cap: As was common in ancient times, certain rulers got so full of themselves that they insisted their subjects worship them as gods. One such was Antiochus IV “Epiphanes”, who ruled one of the fragments of the Hellenistic empire founded by Alexander, and which happened to include Judea. In short, he caused the Temple in Jerusalem to be defiled with unclean deeds and things, including a statue of himself as Zeus, and forbade the practice of Judaism. An uprising followed, by traditionalist Jews collectively called Maccabees. Antiochus was busy elsewhere, fighting the Parthians, and the general he sent to put down the rebellion lost. The Temple was cleansed and restored, and proper worship could resume according to the commandments in Torah. One of those commandments has to do with the menorah. You’ll find it in the descriptions of the Tabernacle (Exodus 25:31-40), which was the portable temple carried by Moses’ people before they crossed the Jordan, to house the Ark. Although, according to that Wikipedia article, the fate of the original menorah is unknown, possibly the Maccabees had a new one made as part of the Temple restoration. That’s the “lamp” for which consecrated oil was needed. Did you know that the Books of Maccabees which appear in the Roman and Orthodox Christian versions of the “Old Testament” are not part of the Jewish Bible? Back when I was studying to become a Jew, my rabbi explained why: the descendants of the Maccabees, whose dynasty was eventually called Hasmonean, did not preserve the tradition and became as Hellenistic as their former enemies. The 8-day miracle? That’s what we call midrash — an allegory. Another fancy word for it is apochryphal. It’s most likely derived from the Megillat Antiochus, which is at least 400 years younger than the events it alleges to recount, and may have been written as much as 300 years later than that! One suspects that the ritual of lighting candles, and the Hanukkah menorah itself, comes from that bit of apocrypha, too. So why is the holiday 8 days long? “Because Sukkot is,” said my rabbi. The Maccabean decree was for a feast of thanksgiving, and the pre-Hebraic harvest festival which became codified as Sukkot was the obvious example to follow. And why is it in what we now call December? First of all, one does not restore a holy place to its ritual cleanliness merely by scrubbing it. These things take time, especially if you’ve commissioned, among other things, a new menorah of (literally) Biblical proportions. Much more importantly, however — the Hebrew date of 25 Kislev was chosen deliberately to coincide with the Winter Solstice. There are deep psychological reasons why every civilization of every age has a festival during the darkest part of the year, no matter how they justify it terms of religion, “pagan” or otherwise. It goes back tens of thousands of years, maybe even before anyone thought of gods… but the smart ones, even then, watched the sky and counted days and figured out when the sun would start rising earlier and setting later again. Placing our Festival of Lights at the same time gave us an officially-sanctioned Jewish reason to celebrate the same thing in our own way, without being seduced into idolatry. Hanukkah is not “the Jewish Christmas”. It is older than that event by at least 164 years. And it has nothing to do with a day’s worth of oil lasting for eight. It commemorates, as do Passover and Purim, a victory over religious tyranny… and it sheds needed Light into the Darkness.